It was Friday, October 23, 1964. The Nippon Budokan was packed. But perhaps there was a sense of resignation at this, the penultimate day of the 1964 Tokyo Olympics. Despite the fact that three Japanese judoka, Takehide Nakatani, Isao Okano and Isao Inokuma had already taken gold in the first three weightclasses over the previous three days, there was considerable doubt that Akio Kaminaga could defeat Dutchman, Anton Geesink, in the open category. After all, Geesink shocked the judo world by becoming the first non-Japanese to win the World Championships in 1961. More relevantly, Geesink had already defeated Kaminaga in a preliminary bout. So while the Japanese, including Crown Prince Akihito and Princess Michiko who were in the Budokan, were hoping Kaminaga would exceed expectations, all they had to do was see the two judoka stand next to each other to be concerned – the 2-meter tall, 120 kg foreign giant vs the 1.8-meter tall, 102 kg Japanese. Even though judo purists know that skill, balance and coordination are more important to winning than size, deep down many likely felt that the bigger, stronger foreigner was going to win. After all, the bigger, stronger US soldiers and their allies had defeated the Imperial forces of Japan in the Pacific War. And so Geesink did, defeating Kaminaga handily, sending the Japanese nation into a funk. That was late in the afternoon on October 23. About 13 kilometers southwest of the Nippon Budokan and the site of Kaminaga’s defeat, the Japanese women’s volleyball team was preparing for their finals at the Komazawa Indoor Stadium. They too were going up against bigger, stronger adversaries, from the USSR. In this case, however, there was a lingering sense that their magical women of volleyball would defeat the Soviets. They had in fact already done so at the World Championships in 1962, walking into the lioness’ den in Moscow and winning the finals. So when nearly every citizen in Japan had settled in front of their televisions that Friday evening, having the choice of four channels to choose from to watch the match, they were gearing up to explode in celebration. And yet, Geesink had just sunk Kaminaga, as well as Japan’s hopes of sweeping gold in the only sport at the Olympics native to Japan. Maybe we just aren’t big enough, or strong enough, some may have thought. Hirobumi Daimatsu, coach of the women’s volleyball team, accepted the challenge and worked over the years to train his players to compensate for relative weaknesses in size and strength, with speed, technique and guts. And much to the relief and joy of the nation, the Japanese defeated the Soviet Union in straight sets: 15-11, 15-8 and a tantalizingly close final set, 15-13. And on that Friday evening, the day before the final day of Japan’s two-week Olympic journey to show the world that they were a nation to be recognized and respected, a team of diminutive Japanese women took down the larger Soviet women. Whatever lingering sting from Kaminaga’s loss remained, whatever bad feelings of boycotts by the Indonesians or the North Koreans may have left, even perhaps, whatever shame that came from “enduring the unendurable” after the nation’s defeat in the Second World War, may have washed away in that moment the ball fell to the ground for the final point of the match. On that day, Japan was a nation re-born – young, confident, world-beaters. For a wonderful look at Hoare’s past, here is an obituary penned by his daughter, Sasha Hoare, in The Guardian. My father, Syd Hoare, who has died aged 78, was an Olympic judo competitor, author and commentator. The son of Alfred Hoare, an executive officer at the Ministry of Defence, and Petrone (nee Gerveliute), a waitress, Syd enjoyed a wild childhood in postwar London: scrumping, climbing trees, jumping out of bombed-out houses on to piles of sand and being chased by park keepers. At 14, while a pupil at Alperton secondary modern school, Wembley, he wandered into WH Smith and found a book on jujitsu, which led to judo lessons at the Budokwai club in Kensington and sparked a lifelong passion for the sport. Syd quickly became obsessed with judo and underwent intense training, often running the seven miles back to his home in Wembley to lift weights after a two-hour session at the Budokwai. In 1955, at 16 he was the youngest Briton to obtain a black belt and two years later won a place in the British judo team. He respected not only judo’s physical and mental aspects but its link to eastern philosophy. Anton Geesink set the judo world on fire by defeating Koji Sone in the 1961 World Championships. The tall and imposing Dutchman was the first non-Japanese judoka to win in any weight-class in a world championship. However, Geesink wasn’t satisfied with the way he won. He wrote in his book, My Championship Judo, that he used a “halfway trick” to put Sone to the ground before immobolising him for victory. He felt that despite being the world champion, he needed to continue to improve. When Geesink visited Japan in 1963 at the invitation of Tenri University, which had some of the best judoka in the world, he learned that Ne-Waza, or ground technique, was the Judo of the future. “In fact, it was the finals of the open weight class competition at the 1964 Tokyo Olympics when Geesink took advantage of a failed Tai-Otoshi attempt by his opponent, Akio Kaminaga. Geesink instead ended up pushing the Japanese to the mat, immediately maneuvering for a Ne-Waza technique Geesink no doubt sharpened at Tenri University. Geesink wrote in his book that in his time (the 1960s), Ne-Waza, or ground technique, was considered minor by many Japanese judoka purists. “They are – in my opinion – too romantic with their insistence on deciding the contest by a spectacular throw.” But he learned in Japan that for training to be successful, 60% of the time needed to be spent on Ne-Waza, and the remaining 40% on Tachi-Waza. My opponent is recumbent on his back. I am at his right side, my right leg stretched forward, resting on the outside of the foot. My left leg is bent, so that I sit in what one might call a hurdling posture (think of hurdle-racing). My right arm passes around his head, so that I can hold his upper-arm with my right hand. With my left arm I lock in his right arm, which is gripped around my body. My armpit presses against his wrist and with my left hand I grip him precisely under his elbow. Consequently my opponent’s right arm forms a right angle; his elbow sticks out. By concentrating my full weight on his trunk, resting only on the outside of my right foot and on the sole of my left foot, so that my buttocks have no contact with the ground, it has become impossible for him to move. If my opponent should succeed in resting the back of his head on the ground, he might be able to develop enough strength to free himself from my immobolising hold. To prevent this, I draw my right arm so tight that his head is moved forward, away from the ground. He has now become quite helpless, immobolised. And when that actually happened in the finals of the open weight class at the 1964 Tokyo Olympics, when Geesink immobolised Kaminaga in this Kesa-Gatame hold, an entire country fell into collective shock. Okuri Ashi Harai 1, from “My Championship Judo”. Geesink is the judoka in the background. In 1964, when judo debuted at the Tokyo Olympics, it had already built up a strong international following. Still, the Japanese were the dominant competitors by far, and Japan was the mecca for judoka around the world. The Judo community at the time was aware of the rise of Dutch judo giant, Anton Geesink, because of his surprise victory at the 1961 Judo World Championships in the open weight class, the only non-Japanese to ever win an international title at the time. But Geesink’s victory at the 1964 Tokyo Olympics let the entire world know that judo was very much an international sport. After winning the gold medal at the Tokyo Olympics, Geesink put his energies into coaching others in judo. He wrote a book in Dutch called “Mijn Judo,” in 1966, which was translated into English the same year. I recently got a hold of that book, My Championship Judo, and saw that Geesink’s development as a judoka was a series of building blocks of techniques he learned throughout the 1950s and 1960s. “My Championship Judo” is predominantly a training manual, explaining and showing in detail the key judo techniques. But at the end of the book, Geesink talks about how his development went through different phases of focus: Ashi-Waza (leg work) to Uchi-Mata (over-the-thigh throw) to Sasae-Tsuri-Komi-Ashi (which Geesink called “Lifting Leg Block”), and Ne-Waza (ground work). This four-part series will share Geesink’s insight into each of those techniques. When Geesink was a teenage judo sensation in the Netherlands, he loved his leg work. He said that he played a lot of football where legwork was important, where speed and mobility were vital to success. Thus Geesink believed, is why he developed his Okuri-Ashi-Harai technique, a throw under the category of Ashi-Waza (leg technique), so early in his career. To perform Okuri-Ashi-Harai I have put my left leg closely round my opponent’s right leg in order to get my foot against the outside of his ankle. As he has not drawn his legs together, he can turn his right foot so far that my foot gets only as far as his instep. Now Okuri-Ashi-Harai has become impossible and I again product a combination. I quickly take my foot off his instep, place it about 2 inches in front of his toes and keep tugging at him, so that his full weight is transferred to his right leg. (See picture 1.) I have acquired a splendid position for O-Soto-Gari. I raise my right foot high to the front (picture 2) and with a terrific sweep of that leg I shear my opponent backwards of his feet (picture 3). Imagine you have a sport growing in popularity, growing so quickly that it takes roots in countries all over the world, developing at different speeds, with slightly different rules depending on where it was played. When judo first began holding international competitions, a rift occurred between the rules that dictate judo in its birthplace, Japan, and the rest of the world. Judo-ka in Japan were traditionally not classified by weight classes, so you would have a 90 kg judoka face off against a 60 kg judoka. International bodies believed that fairness could be better achieved by having people of similar weight compete, as has been done with success in boxing. Who makes the rules? Who decides who goes to a national or an international competition? In the case of the Olympics in the post-war years in America, when money began to be invested in the development of sportsmen and women, it was the Amateur Athletic Union, otherwise known as the AAU, which emerged as the national governing body for many sports disciplines, including track and field, gymnastics, wrestling, basketball and many others. According to the book, “History of the United States Wrestling Federation / USA Wrestling” by Werner Holzer, the AAU had become a very powerful entity, frustrating coaches and athletes alike due to perceived lack of funding and support. This frustration was particular true in the “smaller” disciplines of wrestling and gymnastics where AAU mindshare appeared much greater in track and field. Ron Barak, a member of the 1964 men’s Olympic Gymnastics team, and today a practicing lawyer and novelist, first met George Gulack in 1962, when Barak was a sophomore at USC. 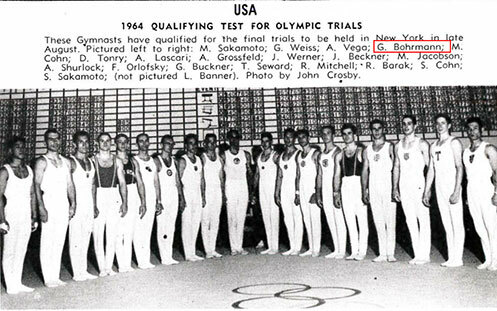 Barak competed in that year’s National AAU Championships which served as the trials to select the U.S. men’s team that would represent the U.S. in the 1962 World Gymnastics Championships. Natural grade inflation in subjectively graded sports such as gymnastics, diving and figure skating favored the more established veterans in those sports. It’s just the way it was, according to Barak. This was Barak’s first appearance on the national scene, he told me, and he personally had no expectations of making the 1962 World Gymnastics Team and so he felt he was there to pay his dues and gain experience for what he was really after, a chance to make the 1964 Olympic Team. But something strange happened over the three-day trials. For the first two days, Barak said he flew under the radar, largely unnoticed. He recalled that he was performing well and scoring well, and yet still felt more like a spectator than a competitor. However, after two days, he found himself in serious contention to make the 1962 World Games Team. He began to believe that all he had to do was perform at the same level on the last day and score at the same level, and he would make the World Games Team. Barak said he performed even better on the third day than on the first two days, but strangely, he told me, his scores plummeted, and he missed the team by a slim margin. Barak said that Gulack came up to him after the competition was over and said “Don’t worry about it, Ron, your time will come. Just be patient.” Barak wasn’t sure what to make of Gulack’s words. Literally, they were nothing more than innocent words of encouragement. But Gulack, Barak said, presided over that three-day competition like it was his personal fiefdom and he was calling all the shots. Gulack was used to having his own way. He could occasionally be pleasant, Barak recalled, but more often he was a bully, if not an outright tyrant. Did Gulack’s words to Barak signify something more than their plain meaning? Lots of innuendo but no way to know. Barak suspected that because the male gymnasts on the whole were a veteran team, most of whom would not continue to compete much after 1964, Gulack had little to threaten them with even if he could. According to others, Gulack appeared to exercise significant influence in the selection of the women’s gymnastics team. During the Olympic Games, several weeks after the official trials had ended in the United States and the women’s gymnastics team roster had been set, Gulack re-set the team roster in an unscheduled competition. Members of the women’s team were rankled, and itching to push back. A rebellion was brewing and would come to a head in Tokyo in October of 1964. A friend of mine in Denmark recently sent me a wonderful gift – a commemorative souvenir stamp sheet that went on sale on October 10, 1964, the opening day of XVIII Olympiad in Tokyo. It is a beautiful set that show off some of the iconic venues of the Tokyo Games, including the 30-yen stamp featuring the Nippon Budokan Hall. The popular Japanese martial art of judo was debuting at the 1964 Games, and the Japanese government decided to build a structure just for judo at the Olympics. Not only was the stamp publicizing the Budokan, it was helping to pay for it. From the first Olympic Games in 1896 in Athens, governments have raised funds for Olympiads through the issuance of stamps. According to the IOC, more than 50 million Olympic stamp series have been issued since 1896, generating revenue for Olympic operating committees through surcharges on stamps. An organization called the Olympic Fund Raising Association was created in December, 1960, mandated with raising funds primarily from private sources. The Association was responsible for raising funds for the Olympic Organizing Committee, the Japan Amateur Sports Associations to help raise the performance level of athletes in Japan, as well as for the construction of the Budokan. And according to the final report of the Olympic Games published by the Tokyo Olympic Organizing Committee, stamps were the Association’s best money maker, as you can see in the table below. What’s also interesting is the number of fund raising projects the Association oversaw: advertising in telephone books and trains. And not only did they make money off of selling cigarettes, but also thanks to legalized gambling in motorboat, bicycle and motorcycle racing, among many other things. The Olympic Fund Raising Association raised a total of around JPY6 billion (USD16 million), and 16% or JPY963 million was due to stamps. The inside of the commemorative stamp booklet. The pictures are the first two pages of photo profiles of Americans on the US Olympic squad, from the summary report of American performance at the 1964 Tokyo Olympic Games. As you can see and likely understand, America at the time demographically was generally perceived to be white. But it was changing, as minority groups, be they black, latino or Asian for example, were growing in size. Consequently, their representation in American Olympic squads were also growing. But this was 1964, and race relations were beginning to brew, and get attention. In fact, it was October 14, 1964, the fifth day of the Tokyo Olympics, when the powers that be in Norway awarded Dr. Martin Luther King Jr the Nobel Peace Prize. In 1964, diversity and inclusion were not buzzwords in corporate America. They were in some ways an alien concept, something that you might only visualize if you happen to be passing through the United Nations when it was in session. But there was one shining example of that on Team USA in 1964 – the Judo team – represented by a Caucasian Jew (James Bregman), a person of Native American Indian descent (Ben Nighthorse Campbell), a Japanese-American (Paul Maruyama) and an African American (George Harris). Judo is not a team sport. It is very much mano-a-mano, and while you learn from others, training can be done independently. In other words, in the case of the 1964 Team USA judo squad, their diverse make up did not necessarily contribute to their actual performance beyond the fact that they were all good friends, four of the few foreigners who ventured to the mecca of judo in Tokyo to live and train. But for James Bregman, who won a bronze medal in the middleweight class at the 1964 Games, the “rainbow team” was an inspiration to him. Bregman didn’t object to being bussed out – he said he really wasn’t conscious of the socio-economic context of race relations at that time. But he did know that he was beat up in his neighborhood. Very often the bullies would be black, but Bregman told me that he was brought up not to judge, that he should be respectful to everybody and that a few bad guys did not represent an entire group. And yet, he was getting beat up nonetheless. Bregman was a small boy, often sick, dealing with bronchitis and asthma as a child. His parents thought that keeping him active indoors would help, so he got lessons in baton twirling, tap dancing, gymnastics, acrobatics as a kid. But one day, his parents learned of a judo club in the officers’ athletic club at the Pentagon in Washington D. C. that also was open to the public. Bregman’s parents took him to the club and suddenly, he was hooked on judo. And the officer’s club was also eye opening, the closest he would come to being inside the United Nations. Although the Officer’s Athletic Club was located in Virginia, it was not segregated since the Pentagon was the Federal Government’s military headquarters. You had black, whites, hispanics, Japanese, Chinese, people from embassies all over the world. The club membership was multi-racial, multi-cultural, multi-religious. From the time I was 13 years old, those were the people I hung out with. Maybe it was subliminal, but it gave me an understanding that hatred based on these externalities was ridiculous. In fact, what Bregman understood, as did his teammates on the US judo team, what brought them together was far more substantial than what set them apart. Harris, Campbell, Maruyama and Bregman had all trained together in Japan for 3 or 4 years, their tight friendship forged in the common experience of two-a-day training – relentless, punishing and exhausting training. According to Bregman, they were more interested in becoming waza-shi, or highly proficient in judo technique, than winning competitions. That’s not an easy thing to do – to subsume your ego for the greater good of your ultimate goals and earn the respect and assistance of others. Campbell told me most other Americans could or would not do so, and did not continue with their training in Japan, excepting two other Americans at Meiji on his Olympic squad: Paul Maruyama and Jim Bregman. So many factors result in the seemingly random way successful people and leaders emerge. In addition to his high level of physical skills, Campbell’s emotional intelligence – his ability to show respect and humility in a new cultural milieu, to build relationships that will help him drive toward his and his colleagues’ goals – appears to be a key factor in the success he has had through his life. Campbell would serve in the House of Representatives and the US Senate for nearly 20 years. Broadly speaking, success is due to a mixture of skills, naturally gifted through DNA or developed through experience and effort, as well as circumstance and how one reacts to it. While Campbell said that training in Japan was tough, in some ways, he had gone through even more challenging experiences as a child. He was the son of Albert Campbell who suffered from alcoholism, and of Mary Vierra, who had to live and work in a sanatorium much of her life due to her contraction of tuberculosis. Since his father struggled to find work, as did many during the Great Depression, and his mother could have only minimal contact with her children due to the contagiousness of her disease, both Ben and his sister Alberta Campbell had a nomadic childhood of foster homes and orphanages. According to Campbell’s biography, Ben Nighthorse Campbell: An American Warrior, the siblings grew up hungry, feeling abandoned, and had to negotiate the randomly rough relationships of life in the orphanage – situations ranging from disciplinary beatings and haranguing for not washing one’s hands to fear of sexual abuse. And because the orphanages would keep males and females separate, Ben and Alberta could not support each other as brother and sister during these complex emotional times. As it turns out, Ben and Alberta had different reactions to these trying times. At the age of 44, Alberta overdosed and died on a potent combination of sleeping pills and alcohol. Ben somehow found lessons of life in his childhood struggles, as noted in his biography. These were not lessons that were learned over night. An underachiever in school who would have run-ins with the police on occasion, Campbell eventually learned after a 2-week stint in juvenile lock up that he needed greater discipline and direction in his life. Campbell was 17 when he decided to enroll in the United States Air Force, where he served in The Korean War, and sharpened his judo acumen. But there was always an inner dialogue taking place within Campbell, a key ingredient in honing a potent emotional intelligence. After the Tokyo Olympics, Campbell began to more strongly identify with his native Indian roots. As he explained in his biography, his father was Cheyenne, a native Indian tribe based in the Great Plains of the United States. Native Indians were an oft-discriminated peoples, and so Campbell kept his Cheyenne connection quiet, revealing it to his son only in his love for making jewelry. But it became important for Campbell, the Olympian, to better understand who his ancestors were, and thus who he was. Campbell learned of his connection to a family line named Black Horse, and developed a deeply personal relationship with the Cheyenne. As successful people do, he understood the story of his life, how he connected to the past, and his obligations to his people in the present and the future. His love of the outdoors and art was not a random interest but a connection to a culture he was ingrained within to a degree he was not conscious of until late in adult life. I believe the time he spent there was a period where he learned a great deal more about himself as an American and as a Native American, because only when confronted with another culture do you truly begin to question and appreciate your own heritage. Campbell is retired from politics, but running a successful jewelry business and still in good health and expectant to return to Japan in 2020, as are his teammates from the men’s judo team. For a kid from California, who grew up without a home, he now has three, real and symbolic – one in Colorado, another in Montana where his of Cheyenne family reside, and a third in Tokyo, where years of hard work first began to blossom.